Save $400 on the Sentry Autoclaves! For a limited time, when you use promo code AUTO18W at check out, you can save $400 and get free shipping* on the new 8L or 16L Sentry Autoclaves. Hurry, this offer is only valid through 7/31/18! 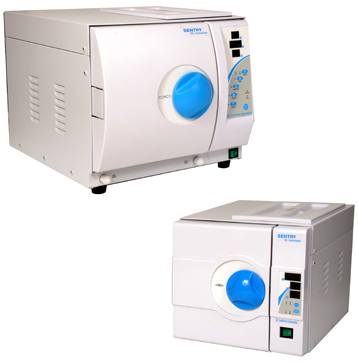 The Sentry Autocalve Steam Sterilizers are compact, easy to use, and perfect for any lab. These autoclaves feature convenient preset cycles and automatic operation which starts at the push of a button. They come with everything you need to sterilize your surgical instruments and labware without leaving your work space. Each unit includes stainless steel trays and tray rack, tray removal handle, draining hoses, spare door seal, and replacement fuses.